"USS Enterprise" in "Star Trek: The Motion Picture"
There's a reason that "Star Trek: The Motion Picture" has been nicknamed "Star Trek: The Motionless Picture" by fans. 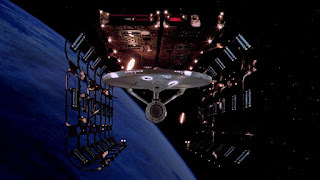 Gene Roddenberry apparently took his cues from movies like "2001" to fill the gaps and plot holes in the thin story by padding it with unnecessarily long special effect shots and unnecessary story lines. What if you took all the important plot points and put them all together without the filler? You'd get about five minutes of actual movie. At least, that's the premise of this video by Omega Ordained on YouTube who managed to cut the movie down to five minutes without resorting to fast-forwarding or taking out important scenes. That's right, five minutes. It's surprisingly coherent. He even kept the very important "Spock, sit down" scene. What do you think of the edit?